Charlo High School students examine a heart during a school medical program. 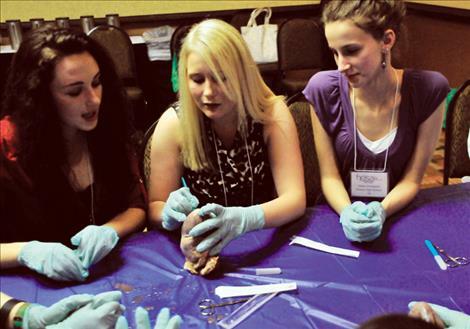 Students from schools all over Montana practice medical procedures during the state conference. LAKE COUNTY – Before they even graduate, students in Charlo, Ronan, and Polson High Schools are preparing for future medical careers. The students belong to individual school groups that are part of the Montana chapter of the HOSA Future Health Professionals Club. The Montana chapter is part of the national group working to provide opportunities for students in an effort to remedy a shortage of qualified workers in the healthcare industry. “We don’t have enough people in healthcare, and we struggle to keep the ones we have in Montana,” said Martha Robertson, Montana HOSA director. 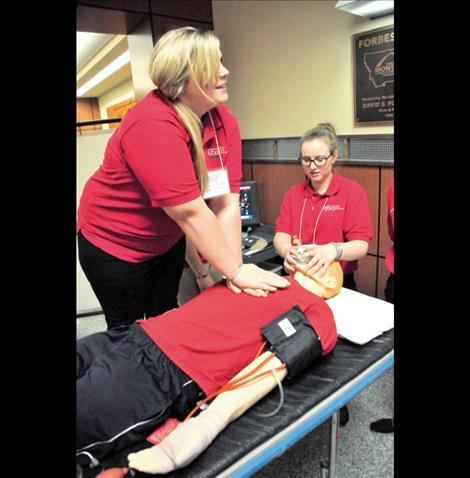 During the year, students in the clubs learn about medical procedures on their own time and they raise funding to participate in a once-a-year Montana HOSA Conference. The two-day conference was in Missoula this year, starting on Monday, March 21. Students participated in mock medical scenarios where they were scored, and they got to talk to healthcare professionals and find out just about any information they needed related to medical careers. “This was a fantastic opportunity for students to learn about careers so they can become highly skilled and highly paid,”said Chris Briske, Ronan club coordinator. Senior Dylan Cooper of Polson wants to be a naturopathic doctor. He said he learned many medical terms studying for the conference. In the human growth and development category of the HOSA Bowl, he took third place. Polson took second place in the competition for A-C schools. They now qualify for the national competition in Nashville this summer. McGuinness grew up among a family of medical providers, so she realized at an early age that she wanted to be in the medical field, but she is still trying to decide exactly what she wants to do in medicine. “I know that I have a passion for helping people, and I love the way the body works and functions,” she said. McGuinness said that anyone in school should try the HOSA program if they are interested in medicine. Samantha Metzger of Charlo said she hopes to become a flight paramedic. Devi Knutson of Charlo said “looking at the pig heart was super cool” at the conference. The students identified the different valves and got a chance to look at the internal workings of the heart. Club representatives for each of the schools said that students would soon be working on fundraising for next year’s conference. Taylor McCready took third in transcultural health for Charlo in the HOSA Bowl. Louetta Conko-Camel and Kara Holmlund took second for Ronan in the emergency medical technician event. Faith Faroni took second for Charlo in the physical therapy category.